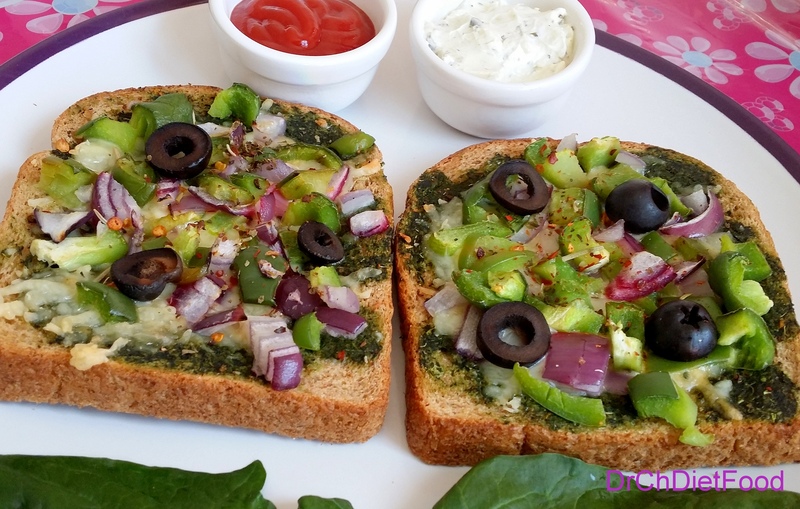 • Spread spinach sauce on one side of the bread. • Sprinkle chopped green peppers and onion. • Then sprinkle cheese and Italian seasoning, chilli flakes & olives on top. • Pre-heat the oven at 200deg and bake it for 5-7minutes /until the cheese melts and bread becomes crispy. Posted on April 18, 2014, in Appetizers, International, Main Course and tagged baking, Bread pizza, drchdietfood, Spinach puree bread. Bookmark the permalink. 15 Comments. Thanx Vidya. …..have a lovely day…. Thanks dear what a wonderful compliment. ..
Wow! Looks really good, healthy and tasty too! Hey Chitra, I am afriad but did not take picture. I should definitely post a pic next time I prepare something from your recipe.